Good afternoon! A beauty of a day here in RBNY Land. 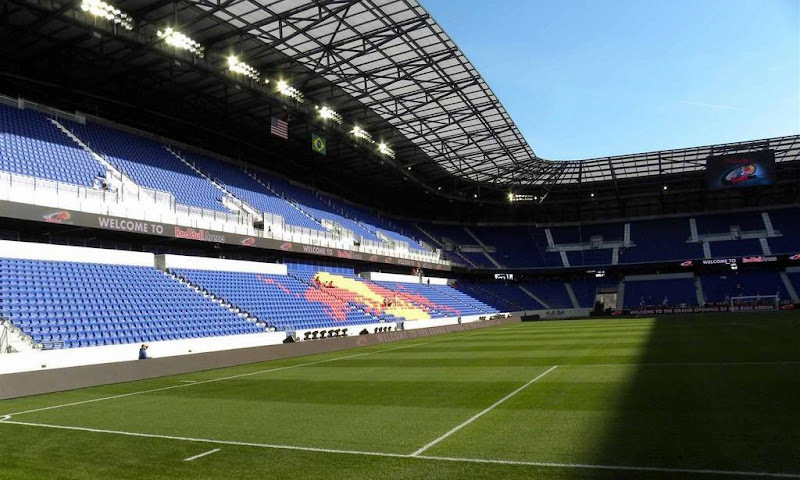 The Red Bulls are in action @The Cathedral of Football, this time against the Houston Dynamo (7:30pm, MSG2). The Dynamo are sporting a 0-1-1 start to the season, with a home loss to the Union, then a road tie @Seattle. Dynamo coach Dominic Kinnear will feel this is not a great start to his team's season. An interesting fact is that the Dynamo have never travelled to these parts and defeated the Red Bulls. At home, RBNY has defeated Houston three times, and drawn twice, with last year's 2-1 RBNY win being a thriller. The Dynamo, I'm sure, will be looking to put an end to that statistic. The Red Bulls are coming off a great start to the season, with an impressive home victory over Seattle, then an even more impressive (in my opinion) 0-0 tie @Columbus. Everyone here in Red Bulls Land is still high on yesterday's announcement that RBNY have secured the services of Canadian Midfield Superstar Dwayne DeRosario, one of the top 5 greatest MLS players of All-Time. Right now, in my opinion, we have the best ever MetroStars/Red Bulls team ever put together. The Henry, Agudelo, DeRo offensive triad, with Joel Lindpere and Dane Richards on the wings, almost sounds too good to be true. With the addition of Dwayne De Rosario the Red Bulls have assembled one of the most formidable lineups MLS has ever seen (plus Roy Miller). The atmosphere tomorrow at the Cathedral should be electric and I expect RBNY to stomp all over a mediocre Houston team. I know it sounds crazy, but I like the Red Bulls to win 3-0, with goals from Lindpere, De Rosario and Agudelo. There is just too much firepower for Houston to hang with us over 90 minutes. So, a resounding victory then we ride south to take Philly's scalp next Saturday. I'm going to predict a Red Bulls victory myself, but I'm not going to get carried away with the scoreline. DeRo may, or may not, start but I'm thinking it will take a few games for his partnership with his new forwards to bear fruit. I'm going to go with the Red Bulls taking this one 2-0. Coundoul. Solli. Marquez. Ream. Miller. Richards. DeRosario. Tainio. Lindpere. Agudelo. Henry. This is the premier team in MLS. After a tough week of international play and injuries, the boys are back together, with one key addition: a skillful midfielder to play behind our striking duo in Dwayne De Rosario. I can't contain my optimism this week. 3-0 to Red Bull New York. DeRo will hear the true support of the South Ward when he knocks in his first wearing the badge, and Richards and Agudelo continue their performances the put up while away with their national teams. Bouna will make the most of his opportunity and keep the pressure on Coach Backe to give him his job back. It's not often I'm optimistic, especially when it comes to soccer, but I'm feeling confident this week. The return of Thierry Henry, Tim Ream, Dane Richards, Juan Agudelo, Rafael Marquez and Bouna Coundoul, plus the magnificent acquisition of Dwayne De Rosario, fills me with excitement about this New York team. I'm going for 3-1, with goals from Richards, Henry and DeRo on his debut! DeRo starts. Scores two, Henry and Agudelo as well. I am going with 4-0 but I think that is being pessimistic! Really, barring a series of catastrophic injuries or a plane crash, there is no reason we should not run away with the league. One last interesting fact of note: because Sutton is still recovering from a concussion, Bouna Time is expected to start. If he does, the Red Bulls will have used three different keepers in their first three MLS game. Hope to see you all later @The Cathedral of Football, Red Bull Arena (built by Makita). Viper Out!